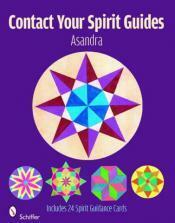 CONTACT YOUR SPIRIT GUIDES by Asandra. This beautifully designed book is a comprehensive training package focusing on how to contact, identify, and work with your Spirit Guides. Asandra, a professional Channel with an international clientele for over 29 years, provides easy-to-understand instructions for the fundamentals of channeling so that you, too, can contact your spirit guides. The book includes inspiring channeled wisdom about the soul-path and special key points, along with lessons on how to use the unique set of 24 Spirit Guidance Cards that will assist you in developing your own channeling skills. Whether you are a beginner or advanced student, Contact Your Spirit Guides and the Spirit Guidance Cards will help you develop a direct relationship with your Spirit Guides. MCA showcases the works of over 100 key artists who've helped bring the Miami cultural evolution to fruition. Asandra is included in this book that has 319 color photos. Asandra has a true story in this inspiring book. Schiffer Publishing, ltd. Asandra has a contribution in this delightful book. Asandra has contributed to this inspiring publication.